A beautiful keepsake ornament has been specially designed for Holland's Bicentennial! 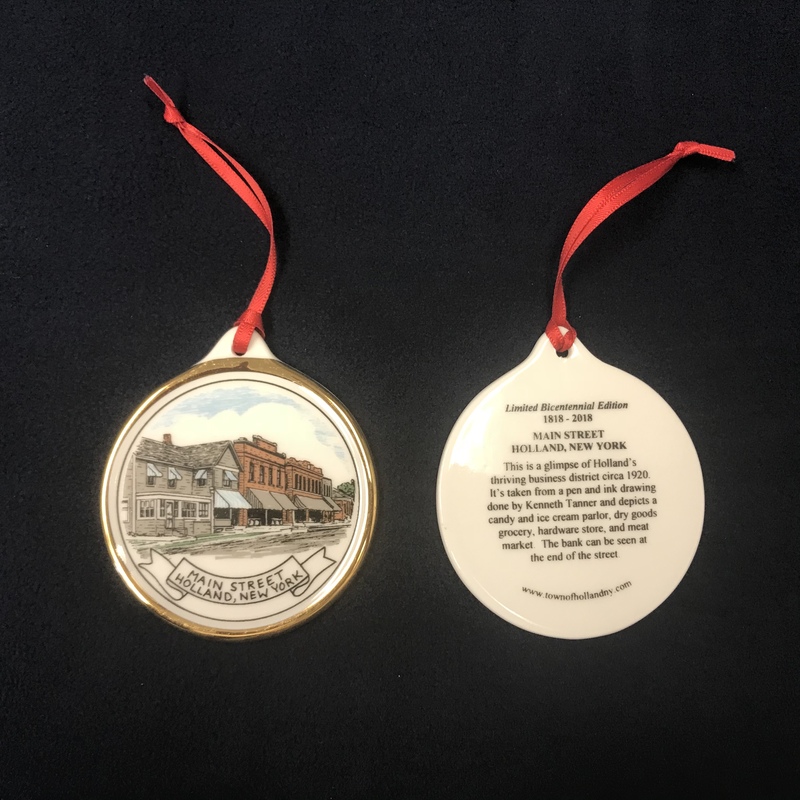 The ornament features a Ken Tanner color sketch of Main Street Holland in 1920. It's done on white ceramic with gold trim, has a red hanging ribbon, and is gift-boxed. It's not just for the holidays! The price is $15 which includes sales tax. The ornament will be available at the Holland Town Hall. Town of Holland History Books are available at the Town Hall! Holland Historical Society's "Time Tested Favorites" Community Cookbook is now on sale at the Town Hall. $12 per book. Proceeds benefit the Historical Society! Erie County Household Hazardous Waste Drop off dates and locations!! Established in 1818, the Town of Holland (pop. 3,612) is a rural and residential community in the center of the eastern edge of Erie County, NY. Holland prides itself on its charming, small-town atmosphere, its fine school system, and its rural friendliness. The Town also offers several shops, offices, eateries, and a NASCAR racetrack. It is also home to the annual "Tulip Festival" held each May since 1956. © Copyright 2011–Present Town of Holland, NY.